Interested in learning to cook as a couple? Well, tonight is the night to grab your favorite person and join us in our kitchen as we learn some delicious recipes perfectly suited for two. You'll learn the consummate date night dinner featuring an elegant menu as we work alongside Chef Richard McPeake – graduate of The Culinary Institute of America, cookbook author and culinary instructor extraordinaire! Chef Richard is passionate about showing you how to make some of his favorite recipes and teaching students fundamental culinary techniques, including plating tips, that will take your cooking and presentation skills to the next level. You’ll be greeted with a glass of wine and a fabulous appetizer of Jack Cheese & Smokey Chipotle Cheese Dip. Then, the cooking fun begins as you tie on an apron and help chef prepare some of tonight’s dishes. We’ll start with a Spring Greens with homemade Walnut Raspberry Vinaigrette. 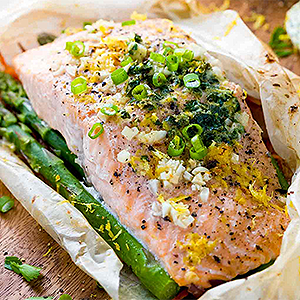 From there, we’ll move on to our fancy-schmancy lesson on the “en papillote’ cooking techniques as you help create our amazing entrée - Salmon en Papillote - that will be served with fresh Asparagus topped with Orange Butter Sauce as our side dish. Finally, you’re in for a special treat as you sit back and watch Chef prepare Fresh Berries with French Zabaglione Sauce, one of his favorite desserts!! What a menu! We’ll furnish the romantic ambiance so you can relax and enjoy the fabulous dinner that you’ve help prepare. Fri 8/23/19 6:30 - 9:00 p.m.